SYDNEY, N.S. 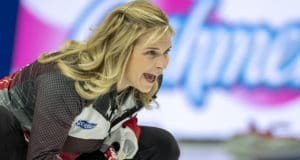 – Chelsea Carey and Team Alberta overcame a 5-1 fourth-end deficit by stealing five points over the last six ends, including two in the 11th, to defeat Rachel Homan and Team Ontario 8-6 to win the 2019 Scotties Tournament of Hearts Sunday evening at Centre 200. SYDNEY, N.S. – It will be two previous champions – Rachel Homan of Ontario and Chelsea Carey of Alberta – playing off this evening for the 2019 Scotties Tournament of Hearts title. SYDNEY, N.S. — A current player and long-time media member were honoured at the Scotties Tournament of Hearts in Sydney, N.S. SYDNEY, N.S. – Chelsea Carey and Team Alberta are on to the final of the Scotties Tournament of Hearts with a chance for Carey to win a second championship on Sunday. SYDNEY, N.S. – Rachel Homan and Team Ontario’s pursuit of a fourth Scotties Tournament of Hearts championship moved one step closer Saturday with a 6-4 win in the Page playoff 3-4 game. SYDNEY, N.S. – Jennifer Jones took one more step towards being the complete Queen of Hearts Friday, winning her record-breaking 141st game in the Scotties Tournament of Hearts as a skip. Her namesake, Colleen Jones held the record of 140 set over her illustrious career. SYDNEY, N.S. 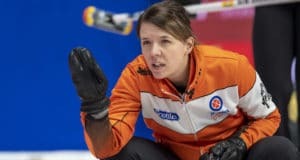 – With their one-day hiccup behind them, Chelsea Carey and Team Alberta put up another victory in the final draw of the Championship Pool on Friday to move into the Page playoff 1-2 game at the 2019 Scotties Tournament of Hearts. SYDNEY, N.S. – Two last-rock draws had dramatically different results for the previous two champions of the Scotties Tournament of Hearts Friday afternoon. SYDNEY, N.S. 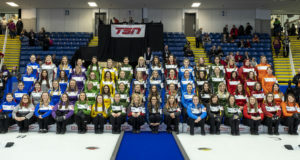 – Parity at the 2019 Scotties Tournament of Hearts continued to be a focal point Thursday with three teams now tied atop the standings and no team in the Championship Pool eliminated going into the final two draws. SYDNEY, N.S. – Jennifer Jones and Team Canada let it be known Thursday they will not easily relinquish their Scotties Tournament of Hearts title after an impressive 10-8 win over previously unbeaten Chelsea Carey of Alberta. SYDNEY, N.S. – Scotties rookie skip Sarah Wark is enjoying her first experience at the national women’s curling championship and it’s been extended for at least two more days after winning a Thursday morning tiebreaker game at Centre 200. SYDNEY, N.S. 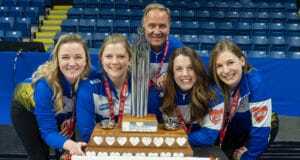 – Defending champion Jennifer Jones and Team Canada (4-3, Winnipeg) joined the pack heading into the Championship Pool at the 2019 Scotties Tournament of Hearts on Wednesday despite losing their final round-robin game. SYDNEY, N.S. 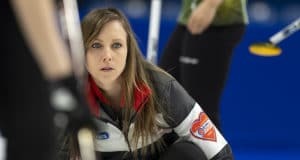 – Chelsea Carey kept cruising and Rachel Homan took an important step forward with Wednesday afternoon victories in Pool A’s final round-robin draw at the 2019 Scotties Tournament of Hearts.